A map can tell me how to find a place I have not seen but have often imagined. When I get there, following the map faithfully, the place is not the place of my imagination. 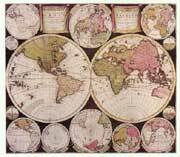 Maps, growing ever more real, are much less true. And now, swarming over the earth with our tiny insect bodies and putting up flags and houses, it seems that all of the journeys are done. Fall '04 office hours: [Adj. 10/26] Wed., 10:30 a.m. - 12:30 p.m.